To Cite: Iskandarov E, Kadaba Srinivasan P, Xin W, Bleilevens C, Afify M, et al. Protective Effects of Adenosine Receptor Agonist in a Cirrhotic Liver Resection Model, Hepat Mon. 2016 ; 16(8):e36821. doi: 10.5812/hepatmon.36821. Objectives: To investigate the role of CGS21680, a selective adenosine A2A receptor agonist, on a bile-duct-ligated cirrhotic liver resection model in rats. Methods: Male Wistar rats were allotted into 3 groups (n = 7 per time-point): the control group, the bile duct ligation + CGS21680 group (BDL + CGS), and the bile duct ligation group (BDL). Biliary cirrhosis had been previously induced by ligature of the common bile duct in the BDL + CGS and BDL groups. After 2 weeks, the animals underwent partial hepatectomy (50%). The BDL + CGS group received a single dose of CGS21680 15 minutes prior to hepatectomy. Blood samples were collected and analyzed. Results: Aspartate transaminase levels were found to be lower in the control vs BDL groups (1, 3, and 24 h) (P < 0.01) and the BDL + CGS (1 and 3 hours) (P < 0.01) and BDL + CGS vs BDL (24 hours) (P < 0.05) groups. Hepatic flow was measured and BDL showed significantly lower values at the 3, 24, and 168 h time-points compared to the control (P < 0.01) and BDL + CGS groups (P < 0.05 at 3 and 168 hours; P < 0.01 at 24 h). O2C velocity was reduced in the BDL compared to the control group (P < 0.001 at 3 hours; P < 0.01 at 24 and 168 hours) and the BDL + CGS group (P < 0.01 at 24 hours). Interleukin-6 levels were abrogated in the BDL + CGS (P < 0.05) and control (P < 0.01) groups versus BDL. Histone-bound low-molecular-weight DNA fragments in the BDL + CGS (P < 0.01) and control (P < 0.05) groups were low compared to the BDL group. Conclusions: Administration of CGS21680, an adenosine receptor agonist, after the resection of bile-duct-ligated cirrhotic livers led to improved liver function, regeneration, and microcirculation. Liver cirrhosis (LC) is a deleterious clinical condition that leads to irreversible damage to the organ. LC distorts the normal architecture of the liver and is characterized by fibrosis, hepatic injury, and nodular regeneration. These changes lead to impaired function and ultimately to organ failure or liver cancer. The causes of LC can be infectious (e.g. viral hepatitis B, C, and D), genetic disease (e.g. Wilson’s disease, cystic fibrosis, hemochromatosis), drugs and poisons (e.g. alcohol, methotrexate), or other conditions such as chronic biliary obstruction. According to the world health organization and the European association for the study of the liver, 1.8% of all deaths in Europe are due to LC, at a rate of 170,000 deaths annually (1). Hepatocellular carcinoma (HCC) is one of the leading causes of death worldwide, and LC is one of the major risk factors for its development (2). Approximately 85% - 95% of HCCs occur in patients with LC (3, 4). HCC is associated with intrahepatic inflammation, oxidative DNA damage, and oxidative stress (5). Chronic inflammation is known to be the root cause for many diseases due to increased proinflammatory cytokines (6). Studies have shown that agonists for G-protein coupled receptors, such as cell-surface adenosine purinergic receptors, upregulate the immunosuppressive cyclic AMP in immune cells. Ohta and Sitkovsky showed that attenuation of inflammation and tissue damage in vivo was due to the non-redundant role of A2A adenosine receptors (A2ARs) (6). A2ARs are ubiquitously present in almost all organs; however, they are highly expressed in the brain and play an important role in the regulation of glutamic acid and the release of dopamine. These features make it an ideal therapeutic target for treating certain conditions, including Parkinson’s disease, depression, and pain (7-9). Evidence suggests that they are also expressed in the liver, especially in Kupffer cells, hepatocytes, and stellate cells (10-12). Mice devoid of A2AR have shown elevated levels of proinflammatory cytokines, in line with elevated biochemical parameters and the histological data. Surgical interventions, such as liver transplantation, partial hepatectomy, and tumor resection, can lead to blood loss and ischemia-reperfusion injury (IRI) of the liver. Portal triad clamping, also called Pringle’s maneuver, is an effective technique to control blood loss during liver resection (13). However, IRI following Pringle’s maneuver may lead to hepatic dysfunction and liver insufficiency (14). IRI triggers a cascade of inflammatory responses in damaged tissues. Extensive research has shown that A2AR activation promotes hepatic ischemic preconditioning both in vivo and in vitro (15-18). A recent study by Dal Ponte et al. showed that ischemic postconditioning using CGS21680, an A2AR agonist, has protective effects on hepatocytes (17). Considering all of the beneficial effects of A2ARs in previous studies, we used CGS21680, a selective A2AR agonist, in the present study. 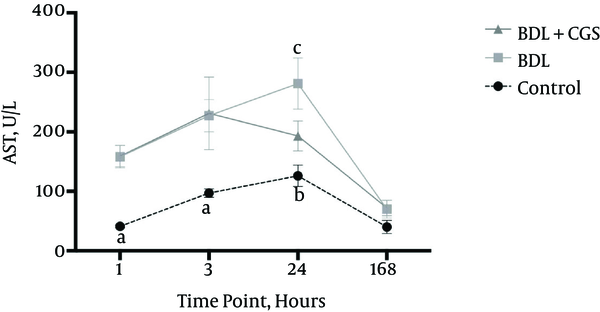 We hypothesized that the administration of CGS21680 in cirrhotic livers induced by bile duct ligation would ameliorate reperfusion-associated injury in an experimental rat model and may improve regeneration. All experiments were conducted in accordance with German federal law and European directive 2010/63/EU on the protection of animals used for scientific procedures. Our experiments were also in compliance with the guide for the care and use of laboratory animals (8th edition, NIH publication, 2011, USA). The governmental care and use committee (LANUV), Recklinghausen, NRW, Germany, granted official permission. Male Wistar rats (Charles River GmbH, Sulzfeld, Germany) weighing 250 - 350 g were used in this study. The animals were housed under SPF-conditions according to FELASA guidelines (www.felasa.org) in a temperature- and humidity-controlled environment (certified according to DIN-ISO 9001/2008) with a 12 hour light/dark cycle. They were allowed food (standard rat diet, Sniff-Spezialdiäten GmbH, Soest, Germany) and water ad libitum. The animals were randomly assigned to the following 3 groups: the control group, with no bile duct ligation (n = 7); the bile duct ligation group that received CGS21680 treatment (BDL + CGS group) (n = 7); and the bile duct ligation group that did not receive CGS treatment (BDL group) (n = 7). These groups were further divided into 4 subgroups according to varying time-points of observation time (OT): 1, 3, 24, and 168 h OT after liver resection (n = 7 at each time-point in each group). General anesthesia was induced by inhalation of 5 vol% of isoflurane (Abbot GmbH and Co. KG, Wiesbaden, Germany) and 5 L/min of oxygen. 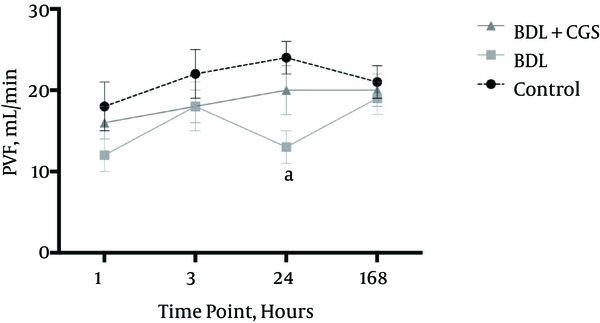 Thereafter, the anesthesia concentration was reduced and maintained at 2 vol% with 2 L/min of oxygen. Cefuroxime sodium (16 mg/kg per 24 hours) (Cefuroxim Fresenius; Fresenius Kabi Deutschland GmbH, Bad Hamburg, Germany), a preoperative prophylactic antibiotic, was injected subcutaneously. As perioperative analgesia, buprenorphine (0.1 mg/kg per 24 hours) (Temgesic; Essex Pharma, München, Germany) was injected for 24 hours or up to 3 days after surgery. Hamza et al. previously described the following surgical procedure (3). A midline laparotomy was performed to expose the abdomen. In the BDL + CGS and BDL groups, we induced secondary biliary liver cirrhosis by ligating the bile duct. Next, through a small incision, the duodenum was reached in order to place the common bile duct under tension. After isolating the common bile duct, the duct was ligated twice using PDS-6.0 (Ethicon, Johnson and Johnson, Lenneke Marelaan, Belgium) and then dissected. The abdominal wall was closed in 2 layers, the first with continuous sutures, then the skin with interrupted sutures. The animals were then placed in a special intensive care unit (Vetario; Brinsea products Ltd., North Somerset, United Kingdom) for recovery, with warmed air (30 - 35°C) for at least 15 min. After 2 weeks, the animals underwent partial liver resection of 50% of the liver mass (left liver lobe [LLL], anterior caudate [AC] lobe, and posterior caudate [PC] lobe). In the BDL + CGS group, the animals were treated 15 minutes before the resection with a single dose of a selective A2AR agonist, CGS21680 (Sigma Chemicals, Deisenhofen, Germany), at a dose of 10 μg/kg body weight intravenously via the penile vein. All surgical procedures were performed under aseptic conditions. In the control group, the same surgical procedure was performed without prior BDL and CGS administration. As a general parameter of hepatocellular damage, aspartate transaminase (AST) release was measured at 1, 3, 24, and 168 hours. Serum samples were collected after liver resection and assessed by a standard enzymatic method using a Vitros 250 analyzer (Ortho Clinical Diagnostics, NJ, USA). We used a laser Doppler flowmeter combined with a near-infrared spectrophotometry device (O2C: Oxygen to See; LEA Medizintechnik GmbH, Giessen, Germany) to measure the microcirculation of the liver. Portal venous flow (PVF) was measured with a transit-time perivascular flowmeter (T403; Transonic Systems, Inc., Ithaca, NY, USA) using a Transonic flow probe (MA2PSB; Transonic Systems, Inc.). Apoptosis was quantified at 24 hours using an enzyme-linked immunosorbent assay (ELISA) kit (Roche Molecular Biochemicals, Mannheim, Germany) according to the manufacturer’s instructions. The assay detected low-molecular-weight histone-bound DNA fragments in the tissue lysate. Results were expressed as arbitrary units (AU). Serum levels of interleukin-6 (IL-6) 3 hours after reperfusion were measured with rat ELISA kits (R&D Systems, Minneapolis, MN) according to the manufacturer’s instructions. Liver tissue sections were collected after resection and the samples were stored in 100 g/L of paraformaldehyde for 24 hours (fixation). Later, the samples were transferred to 40 g/L of paraformaldehyde for storage. The tissue samples were then embedded, sectioned, and stained using hematoxylin and eosin (H&E). Examinations of all slides were performed using a Leica DM 2500 optic microscope (Wetzlar, Germany) under ×400 magnification. An in-house pathologist who was blinded to the experimental conditions scored the lesions on a scale of 1-5 (1 = no or negligible changes, lesions affecting 0% - 10% of the field; 2 = mild, lesions affecting 10% - 30% of the field; 3 = mild to moderate, lesions affecting 30% - 60% of the field; 4 = moderate to severe, lesions affecting 60% - 80% of the field; and 5 = severe; lesions affecting > 80% of the field). Histological evaluation for apoptosis was done by in situ labeling for DNA fragmentation using terminal deoxynucleotidyl transferase-mediated deoxy-UTP nick-end labeling (TUNEL). The TUNEL test was performed using the standard protocol and a commercial kit (Boehringer Mannheim, Mannheim, Germany) provided by the manufacturer. The counting of TUNEL-positive cells was performed with ImageJ software (version 1.48a for Mac OSX, National Institutes of Health, MD, USA), in 5 random fields. The results are expressed as percentage of positive cells. As described previously by Hamza et al. (3), tissue sections were subjected to immunohistochemical staining using the avidin-biotin complex method and diaminobenzidine. The antibodies used in this study were monoclonal mouse Ki-67 (MIB5, 1:10; DACO, Glostrup, Denmark) for assessing the cell proliferation rate. The results are expressed as mean ± standard error of mean (mean ± SEM) for each group. The statistical analyses between the groups were performed using either one-way or two-way analysis of variance (ANOVA) and Tukey’s multiple comparison test. Values of < 0.05 were considered to be statistically significant. All statistical calculations were made using Prism 6.0f for Mac OS X (GraphPad Software Inc., San Diego, CA, USA). AST release was measured as a general parameter of hepatocellular damage. The 24 hours post-resection time-point showed significantly higher levels of AST in the BDL group (281 ± 43 IU/L) compared to the BDL + CGS group (193 ± 25 IU/L). 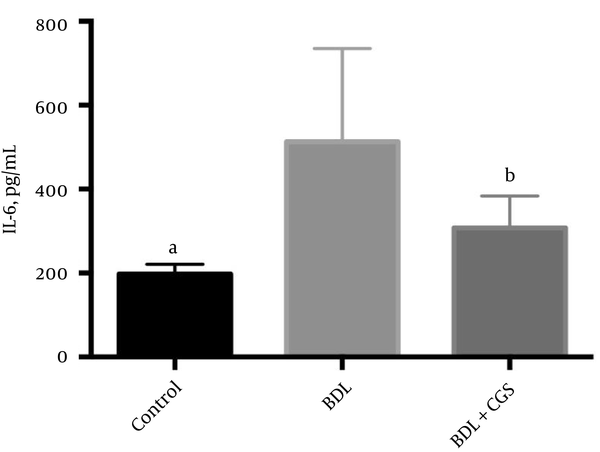 The control group showed significantly lower AST (126 ± 18 IU/L) compared to the BDL group; however, there was no significant difference recorded between the control and BDL + CGS groups. At the end of 168 hours, there were no significant differences recorded between the three groups: control (40 ± 11 IU/L), BDL (70 ± 15 IU/L), and BDL + CGS (72 ± 13 IU/L) (Figure 1). Results are expressed as mean±SEM; two-way ANOVA, Tukey’s multiple comparison test. a, P < 0.01 vs. BDL and BDL + CGS (1 hour, 3hours); b, P < 0.0001 vs. BDL; c, P < 0.05 vs. BDL + CGS (n = 7). O2C flow was measured to evaluate microcirculation in the liver. O2C flow values were significantly lower at 3 h in the BDL group (122 ± 7 AU) compared to the control (175 ± 9 AU) and BDL + CGS (167 ±8 AU) groups. Similarly, the BDL group showed significantly lower values at the 24 hours and 168 hours time-points (137 ± 13 AU and 123 ± 8 AU, respectively) compared to the control group (182 ± 6 AU and 175 ± 8 AU, respectively) and the BDL + CGS group (183 ± 18 AU and 172 ± 17 AU, respectively) (Figure 2A). Figure 2. A, O2C flow measurement in the liver at 1, 3, 24, and 168 hours. Results are expressed as mean ± SEM; two-way ANOVA, Tukey’s multiple comparison test. a, P < 0.01 vs. control (3 hours, 24 hours, 168 hours); b, P < 0.05 vs. BDL; c, P < 0.01 vs. BDL (n = 7). B, O2C velocity measurement in the liver at the four time-points. Results are expressed as mean ± SEM; two-way ANOVA, Tukey’s multiple comparison test. a, P < 0.001 vs. control; b, P < 0.01 vs. control; c, P < 0.01 vs. BDL (n = 7). Similar to O2C flow, O2C velocity was recorded at all time-points to assess the volume of blood flow in the organ. 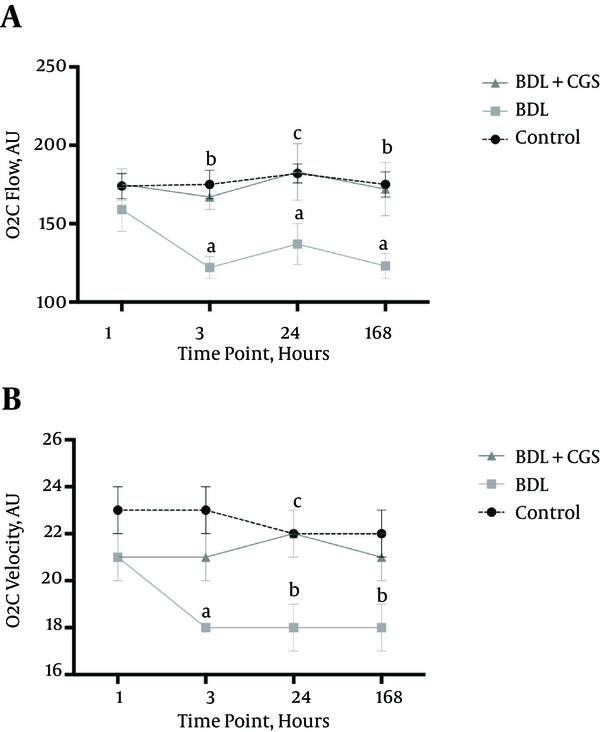 The BDL group (18 ± 0 AU) showed significantly lower values at 24 hours compared to the control group (22 ± 0 AU) and the BDL + CGS group (22 ± 1 AU). Interestingly, the BDL + CGS group showed values similar to those of the control group (Figure 2B). PVF was measured at all time-points, and levels were significantly different at the 24 hours time-point between the control group (24 ± 2 mL/min) and the BDL group (13 ± 2 mL/min). However, there were no significant differences between the BDL + CGS group (20 ± 3 mL/min) and the other two (Figure 3). Figure 3. PVF after liver resection at the four time-points. Results are expressed as mean ± SEM; two-way ANOVA, Tukey’s multiple comparison test. a, P < 0.01 vs. control (n = 7). IL-6 levels are known to be upregulated in tissue damage, leading to inflammation; hence, we measured IL-6 to assess the extent of this damage. The BDL group showed significantly higher levels of IL-6 (512.6 ± 83.99 pg/mL) compared to the control (197.4 ± 8.80 pg/mL) and BDL + CGS (307.8 ± 31.11 pg/mL) groups (Figure 4). Figure 4. Release of IL-6 in the serum at the 3 hours time-point. Results are expressed as mean ± SEM; one-way ANOVA, Tukey’s multiple comparison test. a, P < 0.01 vs. BDL; b, P < 0.05 vs. BDL (n = 7). To assess the extent of apoptosis, we measured histone-bound DNA fragments in the tissue lysate at the 24 hours time-point. The BDL group showed significantly higher levels of these fragments (0.081 ± 0.011 AU) in comparison to the control (0.045 ± 0.006 AU) and BDL + CGS (0.027 ± 0.005 AU) groups (Figure 5). Figure 5. Measurement of low-molecular-weight histone-bound DNA fragments at the 24-hours time-point to assess the extent of apoptosis. Results are expressed as mean ± SEM; one-way ANOVA, Tukey’s multiple comparison test. a, P < 0.05 vs. BDL; b, P < 0.01 vs. BDL (n = 7). Histological analysis and scoring revealed that the control group was the least affected, with a mean score of 1 (negligible damage), while the BDL + CGS group showed a mean score of 2.2 (mild damage) and the BDL group showed a mean score of 4.1 (moderate to severe damage) (Figure 6). Quantification of TUNEL-positive cells showed significantly higher numbers in the BDL group (2.9 ± 0.82 AU) compared to the control (0.04 ± 0.04 AU) and BDL+CGS (0.4 ± 0.24 AU) groups (Table 1). Hepatocyte proliferation was evaluated with immunohistochemistry showing Ki-67-positive nuclei. The BDL + CGS group (9.3 ± 3.2 AU) showed significantly higher positively-stained nuclei compared to the BDL group (1.0 ± 0.5 AU) (Table 1). 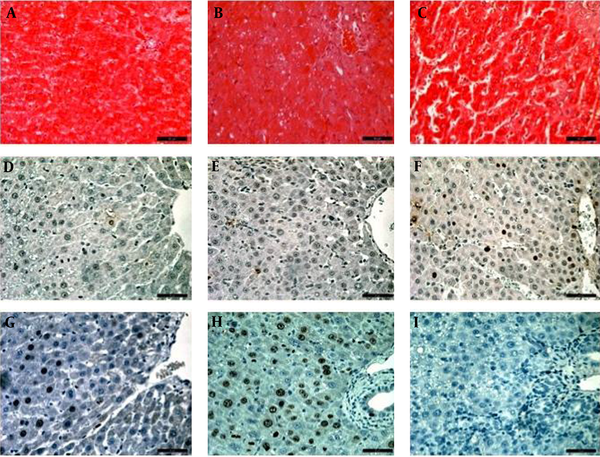 H&E staining of liver tissue 24 hours after resection: control (A), BDL + CGS (B), BDL (C); TUNEL staining for apoptotic/necrotic cells, control (D), BDL + CGS (E), BDL (F); immunohistochemical analysis of hepatocyte proliferation with Ki-67 positive nuclei: control (G), BDL + CGS (H), BDL (I). BDL: bile duct ligation; BDL + CGS: bile duct ligation + CGS21680. × 400. Values are expressed as mean ± SEM; one-way ANOVA. Tukey’s multiple comparison test: n = 5; a,b P < 0.01 vs BDL; c P < 0.05 vs BDL. BDL: bile duct ligation, BDL + CGS: bile duct ligation + CGS21680. Liver cirrhosis is a major contributing factor in hepatocellular carcinoma. Mokdad et al., in their systematic analysis, showed the extent of mortality due to LC in 187 countries between the years 1980 and 2010. Their astounding results showed that LC caused more than one million deaths worldwide in the year 2010 (19). Resection or transplant surgery are still the most accepted treatments for LC and HCC. Surgical interventions carry a higher risk of blood loss; hence, surgeons perform Pringle’s maneuver for safe resection of the cirrhotic liver (13). However, Pringle’s maneuver is associated with IRI, which can cause many complications, including liver failure (20). Research has shown that IRI is one of the major complications of liver surgery, with exponentially increased postoperative morbidity and mortality (14, 21). Apart from the abovementioned complications, IRI is also the most common reason for early graft dysfunction after liver transplantation (22, 23). A variety of preventive measures have been recommended to minimize IRI; for example, Peralta et al. showed that ischemic preconditioning could be an option (20). Alchera et al. suggested that A2AR agonists minimize IRI in the liver (24). A2ARs are known to play a very important role in hepatic IRI (6). Increased cellular consumption of adenosine triphosphate leads to accumulation of extracellular adenosine, which is believed to exert cytoprotective effects on ischemic tissues (25). Research shows that adenosine may inhibit the synthesis of inflammatory parameters via A2 receptor stimulation, or by averting the downregulation of endothelial nitric oxide synthase during IRI (18, 26) Peralta et al. reported that increased adenosine activates A2ARs, leading to increased nitric oxide concentration and thereby blocking hepatic injury during IRI (18). Many studies have suggested that the use of A2AR agonists, such as CGS21680, minimizes hepatic IRI (17, 25, 27). In the present study, we wanted to test A2AR stimulation in a more clinically relevant model; therefore, we induced LC by ligating the common bile duct. We then evaluated the effect of CGS21680 after cirrhotic liver resection. The main aim was to elucidate the role of CGS21680 in the amelioration of IRI-related (microcirculatory/microvasculature) damage. Previous studies have shown that stimulation of A2ARs promotes hepatic preconditioning, first in in vitro and then in in vivo experiments (17, 18, 28). In a small-for-size liver transplantation model, Tang et al. showed that activation of A2ARs by administration of CGS21680 improved liver function, decreased portal hypertension, inhibited apoptosis, and decreased neutrophil infiltration (29). Although A2ARs are distributed ubiquitously, their levels are highest in the spleen, thymus, and leucocytes compared to the liver, where levels are rather low (29, 30). Nevertheless, CGS21680 is known to increase hepatocyte viability under hypoxic conditions (15). Research has shown that CGS21680 has protective effects on hepatocytes, such as vasodilation, decreased inflammation, and suppression of apoptosis (29). In our study, we measured AST levels as a general parameter for hepatic function, and noticed that the enzyme levels were significantly abrogated at the 24 hours time-point in the presence of CGS21680. These findings proved the protective effects exerted by CGS21680, which in turn stimulates the A2ARs. Our results are in line with the results reported by Tang et al. in their study involving CGS21680 in small-for-size liver transplantation (29). Liver grafts are susceptible to IRI damage during surgical procedures, such as liver transplantation or resection. Pre-treatment of rats with CGS21680 is also known to increase tolerance against IR-related damage (24, 28). CGS21680 is a highly selective drug for A2ARs, and various researchers have already established the omnipresence of these receptors (16, 31). However, the most interesting feature of A2ARs are their presence in the vasculature, specifically in the smooth muscle and endothelium. A2ARs are known to mediate adenosine-induced vasodilatation in the hepatic arterial bed (HA) (32). Mathie et al. showed that CGS21680 exhibited 3 times greater potency in inducing HA vasodilatation compared to adenosine (32). The vasodilative properties of A2ARs are well established in the aorta, coronary artery, and mesenteric artery (33). In the present study, PVF showed no significant differences; however, we could demonstrate significantly higher levels of hepatic flow and velocity in the presence of CGS21680. In this way, we could clearly prove that A2AR stimulation with CGS21680 caused vasodilatation in comparison to the BDL group. Furthermore, significantly higher velocity in the CGS21680-treated group validates the vasodilative properties on A2ARs. Nonetheless, the molecular mechanisms behind these results need further investigation. Liver sinusoidal endothelial cells are known to produce IL-6, a pro-inflammatory cytokine. IL-6 attenuates apoptosis and helps in the regeneration of hepatocytes (34). Inflammation and tissue damage lead to increased levels of IL-6; concurrently, an increased level of IL-6 induces insulin resistance and liver inflammation, especially in patients with non-alcoholic fatty liver disease (34). In this study, we noticed the attenuation of IL-6 release in the presence of CGS21680, the absence of which was correlated to significantly higher levels of IL-6. These results were in line with results previously published by Tang et al. (29). 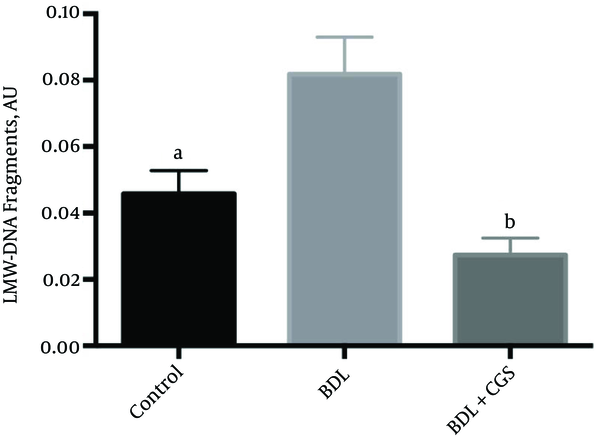 Interestingly, the decreased levels of IL-6 in the BDL + CGS group also showed significantly lower levels of apoptosis. The favorable results of cell death detection and decreased occurrence of TUNEL-positive cells in the BDL + CGS group contribute to the fact that CGS21680 attenuates apoptosis (29). Histopathological analyses showed moderate to severe damage of liver tissue in the BDL group, with semi-quantitative scores showing an increased level of biliary proliferation in multiple liver lobules. Further analysis of the slides also revealed infiltration of inflammatory cells in certain areas, along with necrotic/apoptotic cells. Minor et al. showed that stimulation of A2ARs better protected pre-damaged cold-stored liver grafts, and there was much less IRI-related damage (35). In another similar study, Ben-Ari et al. showed that rats treated with CGS21680 showed significantly lower levels of apoptotic cells; they also showed that the histological sections revealed a high level of acidophilic bodies (25). Simultaneously, proliferative activity was assessed by the number of Ki-67-positive nuclei enterocytes. The end result showed a significantly lower level of Ki-67-positive cells in the BDL group. These results were in line with the previously obtained histopathological results. In summary, after 50% liver resection, cirrhotic livers treated with CGS21680 showed significant improvements in their microvasculature and structure. A2AR stimulation provided robust protection against inflammation and apoptosis. However, further confirmatory studies with larger sample sizes are needed in the future. Our preliminary experimental data clearly showed attenuation of AST levels, improved flow and velocity, better-preserved tissue structure, and improved regeneration upon activation of A2ARs. These promising results could promote CGS21680, an A2AR agonist, as a therapeutic option for liver cirrhosis. The authors thank Ms. Mary S. Elm for language-editing services. Authors’ Contribution: Study concept and design: Rene Tolba and Pramod Kadaba Srinivasan; acquisition of data: Pramod Kadaba Srinivasan, Wang Xin, and Emil Iskandarov; analysis and interpretation of data: Rene Tolba, Pramod Kadaba Srinivasan, Emil Iskandarov, and Mamdouh Afify; drafting of the Manuscript: Pramod Kadaba Srinivasan and Emil Iskandarov; critical revision of the manuscript for important intellectual content: Rene Tolba, Pramod Kadaba Srinivasan, and Koichiro Hata; statistical analysis: Pramod Kadaba Srinivasan, Christian Bleilevens and Astrit Hamza; administrative, technical, and material support: Lai Wei and Boyukkishi Agayev; Study Supervision: Rene Tolba and Pramod Kadaba Srinivasan. Emil Iskandarov and Pramod Kadaba Srinivasan contributed equally. Funding/Support: Dr. Iskandarov was supported by the german academic exchange service (DAAD), No. A/06/09904.